Duenjang-jjigae is the queen of Korean stews, which is made of Korean soybean paste and a variety of vegetables. You can use myulchi broth, which is the most commonly used ingredient, but you can also use seafood or meat as a soup base. 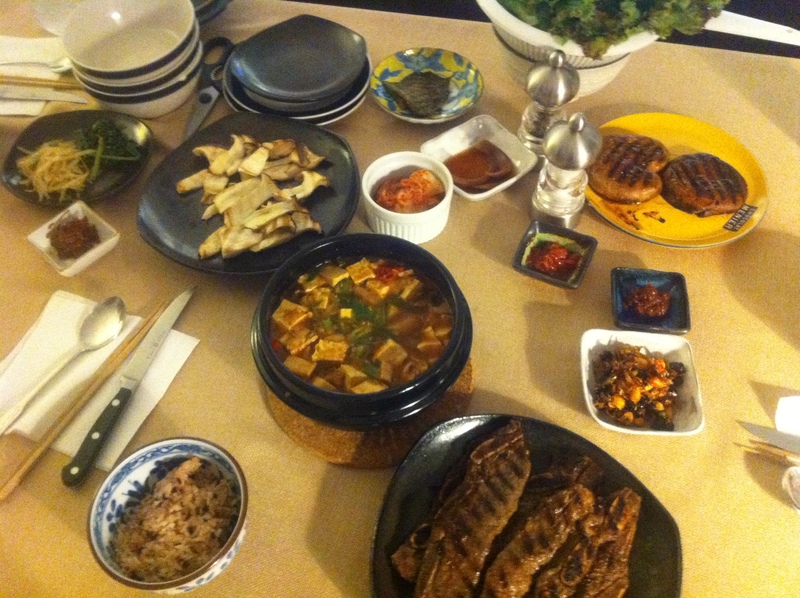 Sometimes it’s even more difficult to grasp a classic dish and I had a hard time mastering duenjang-jjigae. 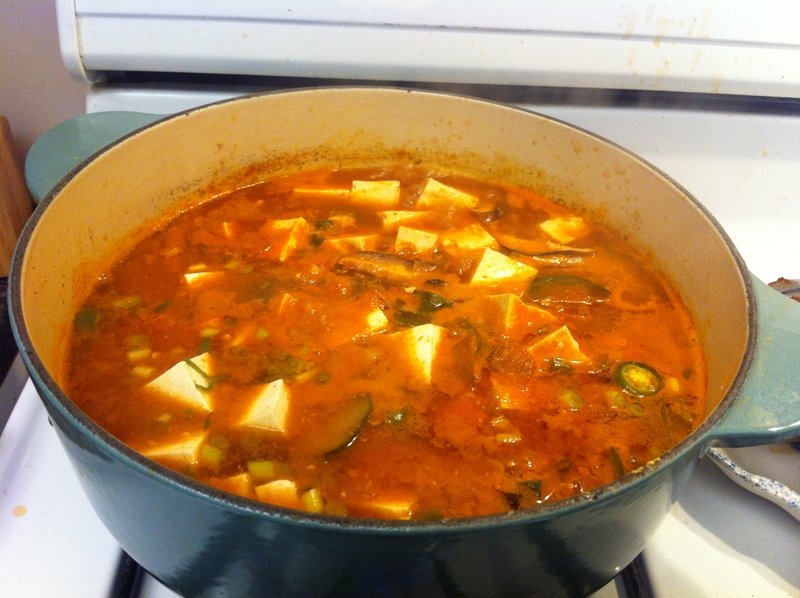 Finally after several years of practicing, I can finally say my duenjang-jjigae is delicious. These days, I do not use rice washed water, which is traditionally used to thicken the stew, due to the scare of arsenic in rice but instead add potatoes. Serve it with rice or even better with a meat dish such as bulgogi or galbi. Bring the myulchi broth to a boil and add the onion, zucchini and potato. Add the duenjang and gochujang. You can add a little more or less duenjang depending on the saltiness of the duenjang you purchase. When the potatoes are fully cooked, add the garlic, mushrooms and tofu. Cook for about 5 minutes. Add the thinly sliced peppers and scallions. Taste the duenjang-jjigae and add salt if needed. This entry was posted in Good for dinner, Good for lunch, Soup/Stew (국/탕/찌게) and tagged Duenjang, Jjigae, Sagol-guk by gangnamkitchen. Bookmark the permalink. I just made this and this is sooo much better than any dwenjangjjiegae that I have made! Awesome!!! I’m so happy…Thanks so much for the feedback.